Everything we know about orcas and all the species of dolphins leads us to understand that they have very close family bonds and a sophisticated culture about which we still know relatively little. But one thing we know for sure is that none of these animals belong in captivity for the purposes of entertaining humans. This young orca is missing her dorsal fin and her right-side pectoral fin. That means she can't navigate well, and can't catch food on her own. You might imagine that the other killer whales in her family pod would have had to abandon her and do what's best for the pod overall. But it seems that what's good for the pod overall involves looking after the youngster, even if this slows them all down a bit. 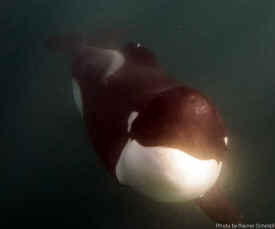 Rather than being left to fend for herself, then, the young orca is being cared for by the rest of the family. Underwater photographer Rainer Schimpf came face to face with the youngster off the coast of South Africa. Incapable of fast hunting and ambushing prey it has to be dependent on the pod which, one assumes, looks after it very well. It shows these mammals are not really just ruthless killing machines but they also have complex, caring social-structures in which they and care for their own disabled members. He said the younger orca was following the family and seemed to be falling behind, staying at a distance while the rest of the pod was hunting for food. But then she would dive down to where the other were – apparently to join in when it was time to eat. Orcas have very close family bonds. Last year, a group of orca experts published a study showing that female orcas have the longest menopause of any nonhuman species. Most animals don't live long after their days of being able to reproduce are over. Humans, as we know, have an extended menopause, and this appears to have developed because of the benefits to the family of having grandmothers who can join in the raising of the children. Like humans, female killer whales ... stop reproducing in their 30s-40s, but can survive into their 90s. The benefit of a menopause to both human and killer whale mothers is in spreading their genes. The different ways this has evolved reflects the different structure of human and killer whale societies. While it is believed that the menopause evolved in humans partly to allow women to focus on providing support for their grandchildren, our research shows that female killer whales act as lifelong carers for their own offspring, particularly their adult sons. That's because in orca families adult sons stay with their mothers as long as the mother lives. One famous orca matriarch, known to researchers as J2 (she's the leader of the "J" pod of resident orcas in the Salish Sea off the coast of Seattle) is thought to be around 102 years old. One of her sons, J1, stayed close to her side until he died, a few years ago, at around the age of 60. Everything we know about orcas and all the species of dolphins leads us to understand that they have very close family bonds and a sophisticated culture about which we still know relatively little. But one thing we know for sure is that none of these animals belong in captivity for the purposes of entertaining humans.